The T110E3 is the tier X American Tank Destroyer on the turretless tech tree. A compact, more mobile version of the T95, the E3 can move around the battlefield much better with its increased top speed, but at the dire sacrifice of overall armor protection. Cutting the side and rear armor by more than half, the T110E3 is much more vulnerable to flanking mediums, and the lack of "skirt" armor on the sides makes the E3 take in more damage from artillery shells. However, the E3 still maintains the 305mm of frontal armor that the T95 is famous for, so fighting this tank from the front is incredibly difficult. Also, the upgraded 155mm cannon is one of the most accurate tier X guns, making this tank good at long range sniping. The increased vulnerability should not scare anyone away from trying to get this tank, as it can still do much of what the T95 was able to do and even more. The T110E3 is a truly devastating tank destroyer. 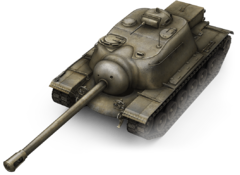 Its ability to reliably bounce shells from nearly all tanks in the game means it can single-handedly distract an enemy team as they focus fire without any significant results. Woe to the enemy tankers who sit face to face with a T110E3 as the likelihood of survival is virtually nil. T95 drivers will notice many of the same characteristics of the T95 in the T110E3 and should play it the same way with some minor adjustments. The T110E3's primary weak point from the front is its lower hull, so T110E3 drivers should seek camping spots that cover this area. If achieved, the only other weak point from the front is the Commander's view port on top of the tank, but even so it is still a very difficult target to hit and bounces shells as well. While faster and more agile than the T95, it is still weak to flanking and getting tracked, so play smart and use reverse and track any tank attempting to flank you and ram his front. Doing so will essentially guarantee a win as their shells cannot penetrate your upper hull and your shells will pierce every time, quickly destroying him. While the side and rear armor is statistically weaker than the front, everything above the tracks is still difficult to penetrate. The T110E3 works best in conjunction with support tanks acting as the tank that leads the rush around corners into enemy formations and focusing directly on the highest tiered tank, running into it if possible. If that support requirement is met, the enemy will shoot the T110E3 in a futile effort only to immediately be overrun. The camo rating for the T110E3 is low so sniping from distance can be difficult except if hidden behind a heavy brush. Sixth sense skill is strongly recommended for T110E3 drivers for this reason. The gun is accurate to specific areas on enemy tanks up to 350m and larger tank sections up to 500m. The T110E3 is still highly underestimated and does not receive as much respect and fear as it should. Take advantage of this doubt as the enemy attempts to exchange shots with you and finish them off swiftly. The only other tank a T110E3 fears fighting against is another T110E3 simply because it's so difficult to damage it. The Armor on T110E3 is 305mm on front, but only in superstructure. It is based on T110E5 which makes it 254mm on lower hull armor, and makes lower plate thick as ~225mm thick only. The cupola mounted on top is extremely strong, as it has its own mantlet and will often bounce even Tier X Tank Destroyers. Gold shells, however, can penetrate it, and High Explosive rounds can often do a good chunk of damage. If playing aggressively, be sure to have support from team mates that will protect you during your fairly long reload. In addition, angling the hull while reloading will help deflect shots aimed for the lower hull plate, but be cautious not to let the enemy hit your fairly weak side armor in doing so. 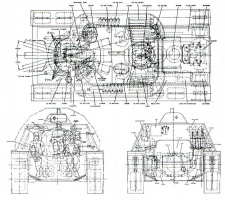 The T110E3 is a Wargaming-modified version of the real-world proposed T110E4 design, featuring a different gun, engine, and highly changed armor layout. This page was last modified on 29 March 2015, at 23:13.